Panama has only recently joined the ranks of copper producing companies with First Quantum's 340ktpa Cobre Panamá, which commenced commissioning in February 2019. It is a significant addition to global copper mining capacity in 2019. Another Latin American country, Ecuador, will also join the ranks of mined copper producing countries in 2019. A Chinese consortium is developing the 95ktpa Mirador mine. Ecuador is an emerging mining frontier with its copper and gold potential attracting substantial investment in both exploration and mine developments. First Quantum Minerals has begun production this year from its 90%-owned Cobre Panamá open-pit mine located 20km from the Caribbean Sea coast in central Panamá. The other 10% interest is held by Korean Resources Corporation. Cobre Panamá’s throughput capacity will expand by 15% to 85Mtpa from 2021. Further expansion to 100Mtpa is expected after 2022. The total cost of the 100Mtpa expansion project is estimated to be US$327m and is expected to increase average production levels to over 375ktpa of contained copper after the 5th year of operation. The Cobre Panamá operation is currently based on Proven and Probable Reserves totalling 3,144Mt at 0.38% copper and 0.07g/t gold. With a forecast initial capex of US$6.3bn, the capital intensity is high at US$8.4/lb of annual copper capacity, with necessary construction of a port facility and 300MW power plant contributing. Tongling Nonferrous Metals and China Railway Construction Company, commenced construction of the Mirador open-pit mine and 20Mtpa concentrator in southeast Ecuador in December 2015. Mirador will be Ecuador’s first largescale mining project. Production from the Mirador South deposit is expected to begin in 2019. 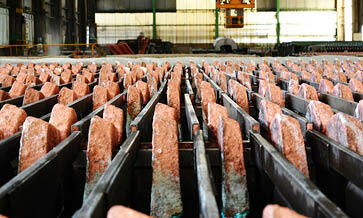 Output is expected to average 96ktpa of copper and 57kozpa of gold in concentrate. The combined south and north deposits at Mirador are estimated to contain a Reserve of 2.96Mt of contained copper, 26.1Moz of silver and 3.2Moz of gold. Following development of the north deposit, copper output from Mirador is expected to increase to 180ktpa. Additionally, there is also one gold project currently under construction in Ecuador. Lundin Gold is developing Fruta del Norte as a 310kozpa of gold operation. Reserves total 15.5Mt at 9.7g/t of gold and 13g/t of silver. Development of underground portals commenced in May 2017. Initial capital cost is expected to be US$669m, with first gold pour in 2020. Ecuador is emerging as an important region for investment in copper-gold exploration. SolGold’s Cascabel project highlights the prospecting potential. The Ecuadorean Government is keen to promote and develop a mining industry. A Mining Ministry was created in 2015, changes to relevant taxation arrangements have been ongoing since 2014 and the granting of mining concessions is progressing. As within any jurisdiction there are risks. In Ecuador, these can be seen in the history of community protest and government intervention at the Llurimagua project. Despite these risks, a number of significant projects are progressing in the country. Llurimagua, formerly Junin, is an advanced exploration stage, potentially large-scale, open-pit porphyry copper project in northwest Ecuador being assessed by an alliance between state-owned ENAMI and Chile's Codelco. The two companies are in the final stage of talks to define the joint venture for developing Llurimagua project. ENAMI estimates there is an Inferred Resource of 318Mt at 0.7% copper and 0.016% molybdenum. In 2015, the alliance drilled 15,000m across 12 drill holes and a further 10,000m was drilled in 2016. Mitsubishi withdrew from this project in 1997 following community opposition. Mitsubishi stake ws taken up by Ascendant Copper (since renamed Copper Mesa Mining Corporation). The Ministry of Mines and Petroleum terminated the concession in November 2008. This decision was based on the results of a Mining Mandate issued by the National Assembly. Over 4,000 mining concessions were affected with many being cancelled. Copper Mesa appealed the decision. In March 2016, a Tribunal of the Permanent Court of Arbitration in The Hague, Netherlands awarded Copper Mesa damages of US$19.48m due to Ecuador's expropriation of Copper Mesa's investments in the Junin and Chaucha projects. The Cascabel project, owned by SolGold (85%) and Cornerstone Capital Resources (15%), is located 70km north of Llurimaga. Exploration drilling has returned very long intersections of moderate-grade copper-gold mineralisation at the Alpala prospect. Hole 12 intersected 1,560m at 0.59% copper and 0.54g/t gold. Hole 9 intersected 1,088m at 0.66% copper and 0.89g/t gold. There are a series of other copper-gold targets within the project area. Alpala Indicated Mineral Resources are 2,050Mt at 0.41% Cu and Inferred Resources are 900Mt at 0.27% Cu. There is potential for further increases with a planned 2019 drilling campaign. SolGold is planning metallurgical testing and completion of a prefeasibility study, investigating both high tonnage open cut and underground block caving scenario, as well as a high grade, low tonnage underground development.The project has gained interest from large miners. In June 2017, Newcrest invested a further US$40m in SolGold following a US$41.2m capital raising. The investment lifted Newcrest's interest in SolGold to 14.54%. Newcrest further increased its share to 15.23% in December 2018. In September 2018, BHP purchased 6% of SolGold for GBP27.42m (US$35m) and then further increased its stake in October to 11.2% for an additional GBP45m (US$59). Grupo Mexico’s Southern Copper obtained permits required to evaluate the Chaucha, or Ruta del Cobre, copper-molybdenum prospect in 2013. Between 2014 and 2018, Southern Copper conducted diamond drilling totalling 7,000m to 25,000m each year. No resource estimate has been published. This year, Southern Copper plan to continue with the development of social and environmental activities and obtain authorisation from the local authorities to move from the exploration phase into the economic evaluation phase of the project. Salazar Resources is exploring its Curipamba project for volcanic hosted massive sulphide (VHMS) deposits. In 2013, the El Domo deposit was estimated to contain 10.0Mt at 2.0% copper, 2.7% zinc, 2.6g/t gold and 51g/t silver in Indicated and Inferred Resources. The Company has also entered into an option agreement with Adventus Zinc Corporation to option a 75% interest in the Curipamba Project with Adventus funding costs of US$25m over five years. Under the option agreement Adventus has agreed to provide Salazar Resources with US$250,000 per year advance payments until achievement of commercial production, to a maximum of US $1,500,000.